The first week of July was Clean beaches week, but here at Aquarium Encounters , we believe every day should be Clean Beaches day! Aquarium Encounters is always trying to do our part when it comes to recycling and staying green; on land at the beach, at the aquarium, or on our days off on the water. When visiting our facility, guests can see first-hand, the measures we are taking to reduce our waste. Our oceans are beautiful and full of marine life. We would love to see this life thrive and stay healthy, by keeping plastics out of the ocean. The Florida Keys is known for its pristine waters, reefs and beaches. Plastics and trash left behind by people end up in our oceans daily. Here are some ways you can help. If you are at the beach, Fishing line, and plastic rings end up in the ocean every day, so every piece of trash that you pick up is already helping the environment. Even if you don’t want to pick up other people’s trash, just taking what’s yours is being environmentally conscious. Recently the aquarium participated in a Manatee rescue that had fishing line wrapped tightly around its fins. This manatee caught itself in a discarded fishing line, and ended up in a predicament that could have been easily avoided. Luckily with the team work of the FWC, Dolphin Research Center and Miami Seaquarium, we were able to help release the manatee from the line. With general admission guests receive a wristband that allows you to leave and come back as much as you would like all day.. These wristbands are colorful, stylish and recyclable! On your way out of our aquarium, be sure to place these wristbands in their proper place, the recycling bin. Aquarium Encounter’s Eagle Ray café offers a variety of tasty snacks and drinks. We try to reduce our plastic by not handing out straws, or lids, unless specifically asked for. Our trash containers are all clearly labeled for trash and recycling. Single use plastics like straws, lids, wrappers, and cups are all contributing factors to micro plastics. Micro plastics are small beads of plastic that are left when a plastic material attempts to break down. These micro plastics are harmful to marine organisms since they are not organic, and are easily ingestible. 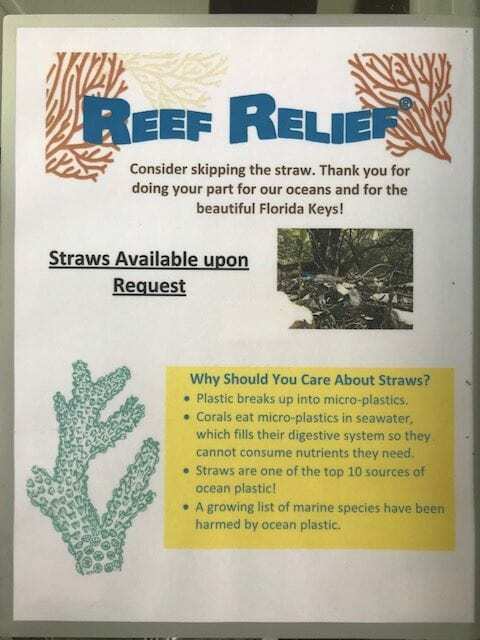 We have signs up around the café, which urge guests to ‘skip the straw’ and join us in using less plastic. Feeling parched and need a drink of water? Bring a water bottle to refill at our water fountain, using reusable bottles greatly reduces the amount of plastic waste we throw away daily. Our water fountain is located next to the bathrooms, and available with cold water all day. We also sell insulated cups in the gift shop and these get you unlimited refills of drinks in the café! Regardless of the day, week, month or year, we should always be environmentally conscious. We have one planet, and picking up trash is a small but extremely important part of saving our planet from being overrun from plastic and other waste. Thank you for doing your part, large or small, all of it counts!